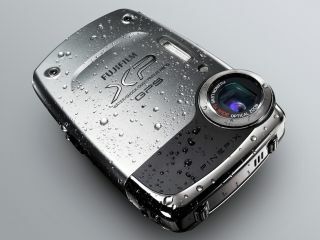 Fujifilm has announced the launch of its new waterproof and shockproof camera, the FinePix XP30. Fujifilm's latest point-and-shoot is set to retail in the UK at £199.99, making it one of the most competitively-priced water, shock, dust and freeze proof cameras on the market right now. In addition to being an affordable and child-proof camera, the XP30 also packs in built-in GPS functionality, so you can tag your holiday snapshots, in case you forget where you were when you took them! "Perfect for holidays, family rough and tumble and active outdoor pursuits, the Fujifilm FinePix XP30 is a sleek camera with a hidden secret – a rugged exterior to protect your precious pictures," reads Fujifilm's launch press release. "Freeze proof to minus 10°C, this rugged snapper is ideal for mountain top snapping. It's also waterproof to five metres, making it perfect for underwater photography or surviving water accidents. "The XP30 is shockproof to 1.5m withstanding small drops and scrapes. And, you won't have to worry about getting sand in it either as the camera is both sand and dustproof. " Specs-wise the new Fujifilm camera has a 5x, wide-angle, zoom lens, 14 megapixel resolution and a decent range of features, plus it can take HD video footage at 720p at 30 frames per second.